Culms 5-120 cm. Leaves: sheaths adaxially strongly dotted purplish red, concave at mouth, not prolonged beyond base of blade; ligules 1.2-5.8 mm; foliage leaf blades 10-80 cm × 2.5-5.5(-7) mm. 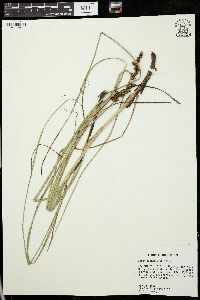 Inflorescences bisexual, evidently paniculate, proximal 3-9 branches well separated, (6-)7-15(-18) × 1-4.2 cm; basal branch with 9-33(-48) spikes; proximal internode 6-27 mm. Pistillate scales translucent with green center, 1.6-2.4 × 1-1.6 mm, shorter, narrower than perigynia. Perigynia spreading, deep olive green to brown, 8-11-veined abaxially, with or without slight median lengthwise depression, without membranous flap toward apex, obpyramidal or obovoid (body very widely obovoid or widely depressed-obovoid), unequally biconvex, 1.8-2.6 × 1.4-2 mm, shiny; beak 0.4-0.7 mm. Achenes oblong-ellipsoid to widely ellipsoid, 1.4-1.7 × 0.8-1 mm. 2n = 60, 64, 66. Fruiting mid Apr-Aug. Marshes, swamp forests, usually on rotten stumps, floating logs, or bases of trees (often Taxodium) or shrubs (Cephalanthus) on lake, pond, and slough margins; 0-300 m; Ala., Ark., D.C., Fla., Ga., Ill., Ind., Ky., La., Md., Mich., Miss., Mo., N.Y., N.C., Ohio, Okla., S.C., Tenn., Tex., Va. 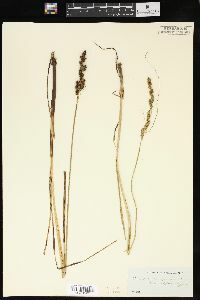 The chiefly southeastern Carex decomposita is in the Ozark (in sinkhole ponds) but not the Appalachian province. 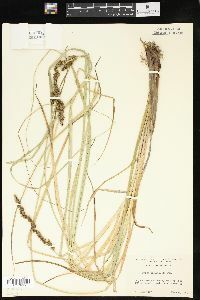 Rare or local over much of its distributional range, it is most frequent on the Mississippi alluvial plain. Specimens to confirm the Marshall and Lake County reports for this very local species could not be located. 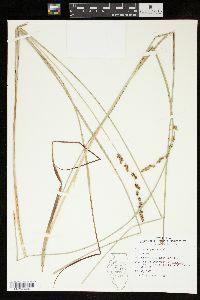 From Pepoon's statement that it is an abundant species in the Chicago region it seems very likely that his report was based upon material of C. diandra or perhaps of C. vulpinoidea. 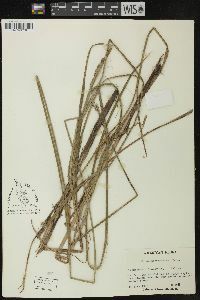 Specimens of C. vulpinoidea collected by Umbach from the Illinois portion of the Chicago region and labeled C. decomposita were found in the University of Wisconsin Herbarium. 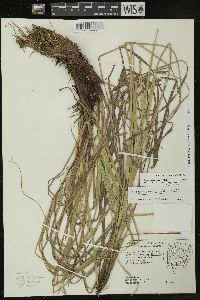 C. decomposita is represented from Indiana by two collections: Deam, June 26, 1898, in bunches of moss on logs in a drained pond, Little's woods, Lancaster Twp., six miles northeast of Bluffton, Wells County; and Kriebel no. 2221, in a knothole at base of tree in swamp, two and a half miles northeast of Avoca, Lawrence County. 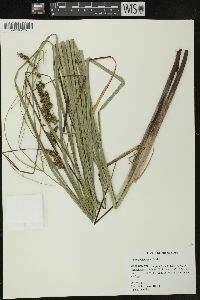 Stems stout, clustered, 5-10 dm, aphyllopodic; lvs ±elongate, mostly 5-8 mm wide; sheaths ventrally pale, red-dotted, and concave at the mouth; spikes androgynous, small, sessile, aggregated into a compound, evidently spicate-paniculate infl 7-15 cm, the lower branches to 4 cm and with numerous spikes; scales triangular-ovate, mucronate, about equaling the body of the perigynium; perigynia deep olive-green, coriaceous, biconvex, obovoid, 2-2.8 mm, three-fifths or two-thirds as wide, obscurely few-nerved ventrally, strongly several-nerved in the basal half dorsally, abruptly rounded above to a rough-margined beak a third as long as the body. Swamps; N.Y. to Mich., s. to Fla. and La. ; very rare in the north.